After Michael Mann set out to direct Collateral , the story’s setting moved from New York to Los Angeles. This decision was in part motivated by the unique visual presence of the city — especially the way it looked at night. Mann shot a majority of the film in HD (this was 2004), feeling the format better captured the city’s night lighting. Even the film’s protagonist taxi needed a custom coat to pick up different sheens depending on the type of artificial lighting the cab passed beneath. That city, at least as it appears inCollateral and countless other films, will never be the same again. 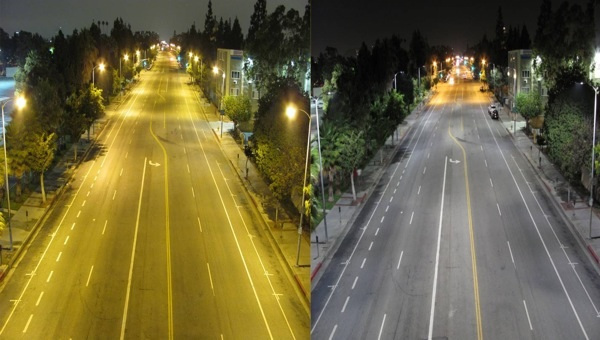 L.A. has made a vast change-over to LED street lights, with New York City not far behind. Read on for why Hollywood will never look the same again — on film or otherwise. Mann chose to shoot HD because of how the format rendered the story’s setting.Considering that Collateral takes place over the course of a single night, its portrayal of LA’s nocturnal landscape is integral to the film. Due to the city’s recent retrofit of over 140,000 street lights, that nocturnal landscape has changed forever. Environmentally speaking, this is a good thing — though it’s easy to get a little nostalgic to put the implications of this retrofit into perspective. In a sense, every night exterior LA-shot film previous to this change is rendered a sort of anthropological artifact, an historical document of obsolete urban infrastructure. The City of Los Angeles estimates it will see at least $7 million in electricity savings and $2.5 million in avoided maintenance costs annually with the switch to LED street lights. Street lighting can account for up to 40% of a city’s electricity bill, according to Eric Woods, writing at the Navigant Research blog . The LED fixtures used in Los Angeles, which include Cree’s XSP series and LEDway series , Hadco’s RX series , and Leotek’s GC series, consume about 63% less electricity, and last much longer, than the high-pressure sodium (HPS) fixtures they replaced. The ecological and economic benefits are rather astounding — but the transition to LEDs has another unique effect, and one that’s specific to filmmakers. Let’s first take a look at what LA has ‘lost’ before we check out what it’s gained, and why it could make a difference on camera. What Makes Artificial Lighting ‘Realistic’? The interesting thing about non-tungsten artificial light sources is that they often produce a non-continuous or incomplete spectral output. This can affect the appearance of certain colors under that output. More simply, you can’t really put colors back in that weren’t there to begin with, even by gelling such a light source or color correcting in post. At left: emitted spectrum of incandescent versus compact fluorescent lamp, courtesy of Wikipedia user Timwether. Notice the non-continual spectral output emitted by the latter (bottom). 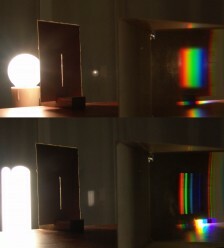 Color Rendering Index or CRI attempts to rate a lamp’s ability to approximate an ideal, continuous spectrum source. 100 is the highest possible CRI score, though some types of artificial lighting — ahem, many traditional street lights — can actually score in the negative numbers. For filmmakers, CRI is a yardstick of limited usefulness because a simple number such as “85″ can’t explicitly tell you which points along the spectral output may suffer, or even how many such points that output may have. On the other hand, a spectral power distribution graph of sufficiently high-resolution will tell you pretty much everything you need to know about a lamp’s spectrum, but information may not be readily available. It isn’t necessarily simple, easy, or inexpensive to get non-tungsten lighting technologies to perform at the level filmmakers want and need. This is why HMI and Kino Flo fixtures do a very good job and don’t come at a low price. That being the case, it’s not hard to imagine that old-school street lights may not hold up so well by comparison — for better or worse. 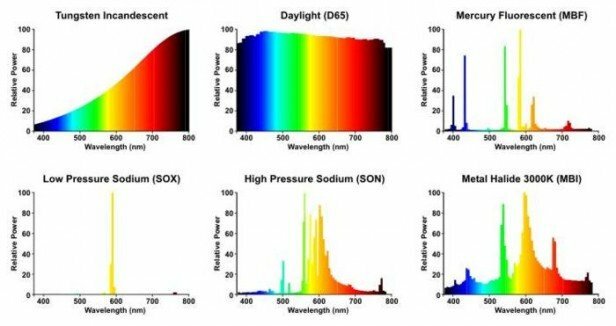 High pressure sodium lamps look less silly when compared by chart, but still don’t hold a candle (I went there) to the spectral power distribution of “full body” light sources such as tungsten lamps or sunlight. They’re also common enough for filmmakers to need lighting gels which help mimic their distinctive output (see also the Collateral writeup in American Cinematographer ). Mercury-vapor lamps, on the other hand, produce better color rendition than either of their more efficient sodium brethren, though their CRI is still poor. Being related to our beloved fluorescents, their cast is generally a ‘cool white’ with a blue-green dominance. Understandably, none of these guys are ideal for the reproduction of natural (never mind pleasant) skin tones. As such, sodium and mercury-vapor lamps are mostly relegated to streets, parking lots, industrial locations, and the like, but in turn give such locations their starkly unique, artificially lit recognizability. At least, until now. According to the Forbes article, the same residential LED fixture going for $432 a piece in 2009 went for $245 by the end of 2012, with its output boosted from 42 to 81 lumens per watt and a life expectancy improvement from 80,000 to 150,000 hours. If I’m doing my math right, that’s about 17 years of life if the lamps were running constantly. How much of an upgrade these LEDs will be over their sodium or mercury-vapor ancestors in terms of performance will likely vary depending on the fixture. Whether it’s an upgrade at all, I think, is a more clear-cut matter: in terms of color rendition, the above comparison speaks for itself. The answer is: yes. The LEDs should very well prove a benefit to existing-light photography. Whether the new look is visually preferable is a subjective matter, but you probably won’t find as many proponents for the old one. Especially considering that many of these LED fixtures lean toward a daylight balance, they may not only offer better overall color rendition, but also better conditions under modern cool-native sensors. 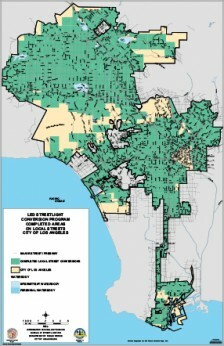 At left is a geographical representation of the program’s progress, courtesy the LA Bureau of Street Lighting (click for full PDF ). It’s visually apparent that filmmakers exposing by the existing street lighting of Los Angeles will be picking up very different imagery, even in many of the same locations, as they might have before. It’s also interesting to consider how Collateral might look if it were shot today (or tonight, I should say), advancements in digital acquisition aside.